As I already told you yesterday, D and I just returned from a much-needed vacation. Our trip out West was based around D’s cousin’s Bar Mitzvah, but we wanted to take this opportunity to do some sight-seeing since neither of us have ever been out to that area of the country. For the first part of our vacation, we flew into Salt Lake City the Saturday before the Bar Mitzvah. 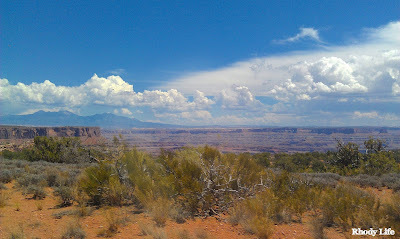 Within an hour of landing, we had grabbed our suitcase and car and were on the road to our first stop, Moab, Utah. In case you aren't familiar with Moab, it is a small city that survives on tourism and driving, is about four hours South-East of SLC. Moab itself is very small, having a population of about 8,000, but because of it’s proximity and home to a few very popular National Parks, Moab gets about one million visitors per calendar year. D and I were two of those million visitors. The drive down to Moab was beautiful. The topography is nothing like we have here on the East Coast, and it reminded me of all the Western movies that you watch on television. It was so mesmerizing, and I couldn't stop taking pictures of what everything looked like. Plus, the weather we had was perfect. The sky was so blue, and the colors of the grass, brush and rocks were gorgeous. We were only spending two full days in Moab, so we had a packed schedule with trying to fit in both Arches National Park and Canyonlands National Park. 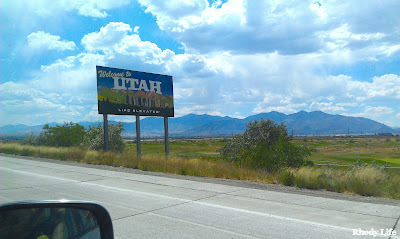 With our flight arriving in SLC in the early afternoon, we were able to drive into Moab, check into our hotel, and then grab some dinner before heading into Arches, which was only a five mile drive from the hotel we stayed at. For dinner, we checked out a Mexican restaurant right on the main strip Downtown, called Miguel’s Baja Grill, and it was delicious. D ordered the fish tacos, which has been the best seller on their menu for thirteen years, and they were delicious. The fish was flaky and tender, and the sauces that came with the tacos were really flavorful. I ordered the chicken tacos, which were also very good, but the fish tacos definitely won the competition. After dinner, we drove the four miles from the restaurant to Arches National Park to check out the sunset. We drove into the Windows section of the park to see the North and South Arches, and the Turret Arch, and to watch the sunset across the horizon and above the red cliffs. You’ll notice that we’re in normal clothes in some of the pictures, so I just wanted to explain that we didn’t think we would actually be climbing up rocks, or walking the hikes in that area because of the time we entered the park, so we didn’t think anything of it after dinner. However, we did enjoy the sunset and climbing up into the arches. Once the sunset had ended, we exited the park so that we could get some rest and try to adjust to the two-hour time difference that comes with traveling from East Coast Time to Mountain Time. After all, we had a long day of sightseeing ahead of us! Have you ever stayed in Moab? What was your favorite place to eat?